How Far is Jains Archway? Reclining in one of the most upscale locations of Chennai, Orme's Road, Kilpauk. The Archway enjoys an enviable pride of place and occupies the most cherished corner hideaway possible. This hallmark of luxury comes in close proximity to places of everyday importance like shopping malls, hospitals and recreation centers. 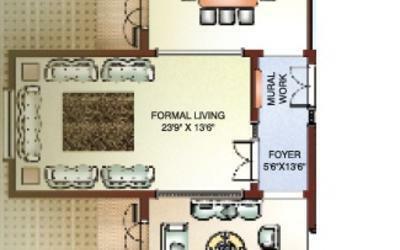 · The flooring in living, bed, dining and family will be of 3’0”X3’0” vitrified tiles. · The flooring in kitchen & balconies will be of first quality Antiskid vitrified tiles. · The flooring in toilets & wash area will be of first quality Antiskid ceramic tiles. ·Kitchen is designed to complement the décor with ceramic wall tiles for 2 feet above the platform. ·To create a world of your own, toilets will have ceramic wall tiles for full height as per architect’s design. · Service areas will have ceramic tile for 4 feet height. · Black granite of size 10’0” x 2’0” will be provided. RCC platform can be provided on request. · Porcelain sink/ Stainless steel sink without a drain board will be provided. ·Main door will be made of teak wood frame with thick & teak veneered flush shutter with intricate steel beeding. ·Bedroom door will be made of teak wood frame with thick & teak veneered flush shutter. ·Toilet doors will be made of teak wood frame with thick & teak veneered flush shutter and one side with teco finish. · French doors and windows of UPVC frame with glass shutters will be provided. · Ventilators of high quality aluminium will be provided. with emulsion paint inviting attention and creating a lasting impression.
. Ceilings will be coated with putty and finished with OBD. ·Other internal and external walls will be coated with putty and finished with emulsion paint. ·Main door will be of Melamine finish. .All other doors will be finished with enamel paint. ·Windows and Ventilator grills will be finished with enamel paint. ·Modular switches of WOODS (or) CRABTREE (or) equivalent will be provided. ·Three-phase supply with concealed wiring will be provided. The actual supply will be single or three phase based on the TNEB rules and regulations at the time of energizing the complex. ·Separate meter will be provided for each flat in the main board located outside the flat at the place of our choice. · Common meters will be provided for common services in the main board. 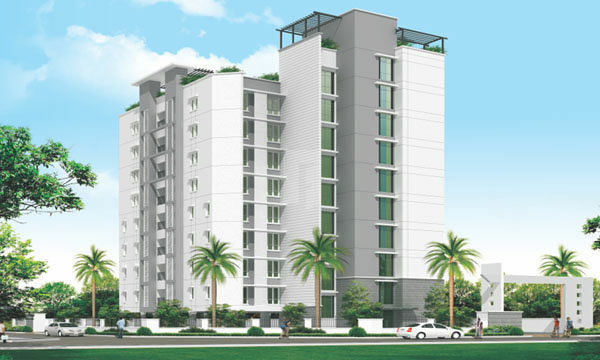 · A/C provision will be provided in all the 3 bedrooms, living & dining. ·15A plug points will be provided for Fridge, Washing machine and geyser in toilets. 750W and 15A points will be of 2.5 sq.mm rating adequate for equipments of capacity of 1500W.
. AC wiring will be of 4 sq.mm which can take up a capacity of 2 tonnes. · Power backup for all the essential points inside the flat & common areas &lift will be provided. ·TV and Telephone points will be provided in the Living and all bedrooms. · The cables for TV and Telephone will be provided from the flat up to a common junction point at a suitable location.
. All toilets will be provided with wall mounted cascade type of EWC.
. Dining will be provided with Designer wash basin. · High quality Jaguar (or) equivalent CP fittings will be provided in the toilets.